1. Vertical stand ideally suited for bending solid copper and aluminum bus bars. 2. "Draw-bridge" frame design is easy to use. 3. 2 lateral parallel-stops for exact angular positioning of bus bars. 4. Convenient scale for reading the current bending angle. 5. Single action cylinder can be uncoupled from the bending unit. 6. 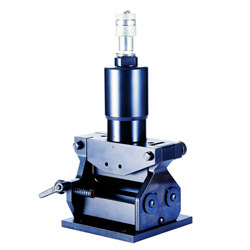 The cylinder can also be connected to the bus bar cutting model HYBC-120. 7. Operated by any hydraulic pump with rated oil pressure of 700 bar (10,000 psi). 9. Max. angle: 90 degree. 11. Cutting materials: Aluminum, copper. 1. Specification: (1) Height: 360 (H)mm. (2) Weight: 15.8 kgs. (3) Max. pressure: 700 bar. (4) Oil required: 124 cc. (5) Max. output: 21.8 ton. (6) Effective stroke: 120 mm. 2. Optional information: (1) Packaging: carton. (2) F.O.B.port: Keelung, Taiwan. (3) Quality / safety certification: ISO 9001 : 2000, ISO 14001 : 2004, IECQ QC 080001, OHSAS 18001 : 2007, CE standards. (4) Made In Taiwan.